Music makes our life bright. Whether it is a wedding ceremony or a workout session – it seems incomplete without music. Music is everywhere around us and a layman can also find himself in such situations where at least basic know-how of free music editor software can be useful. In my case, I used music editor software for the first time to customize a ringtone for my phone. Having said that let’s introduce you to a few music editors that may save your day in the hour of need. 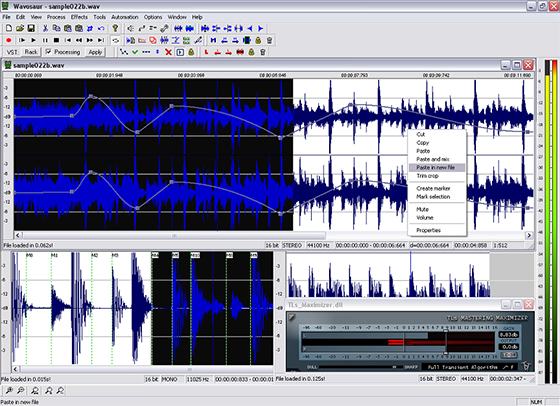 Music Editor Free is free music editor software that can deal with all the prevalent audio formats and enables you to use multiple forms of input for your audio editing requirements. 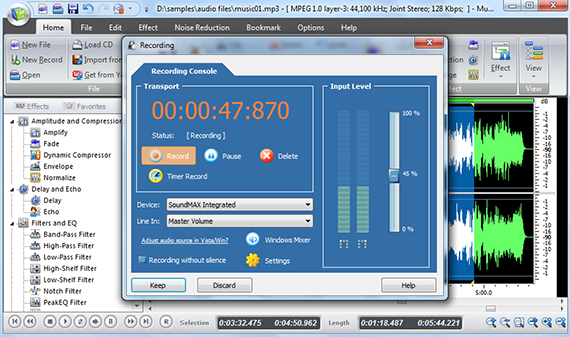 Music Editor Free allows you to record live audio as well as extract audio from media over the internet. For example, you can record the song or playback music from a YouTube video and use the options like cut, copy, insert and trim to give it your desired shape. While editing your music with Music Editor Free you can add special effects to the audio files and reap the superb results of its noise reduction filters, amplification and echo on your music. Once you are done with editing and streamlining your music you can burn it on the CDs without looking for any other program to do so. You can download Music Editor Free to start editing music like a pro. Let’s give you a small demonstration regarding Music Editor Free to show you how to get started with it. 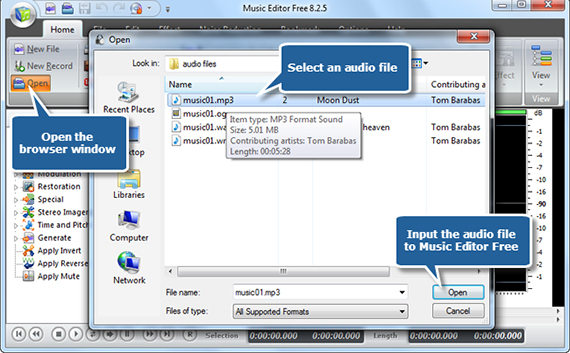 Although Music Editor Free has a lot of buttons representing multiple functions and options – the usage is simple and you follow the same procedures to open an audio file for editing purposes as shown in the image below. Once a music file is loaded it will be shown in the form of a wave spread along the time scale and you can select a portion for cutting, deleting or copying by clicking on the waveform and dragging your mouse till a certain timestamp as required. 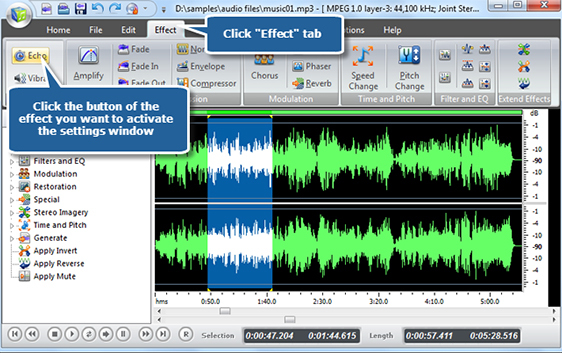 By such discrete selection you can also add effects to it by clicking the “Effect” tab as shown below. If you want to record audio from a mic or from a file that is being played on your PC, just click the “New Record” option in the “Home” tab and below-mentioned recording console will open to allow you record the audio for editing purposes. 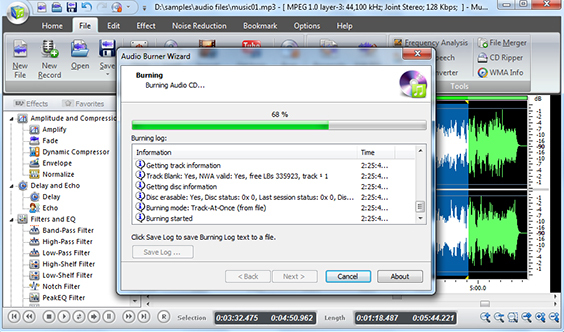 After putting all the things in the right place you can burn the music to the CDs by opening the “Audio Burning Wizard” from the “File” tab. 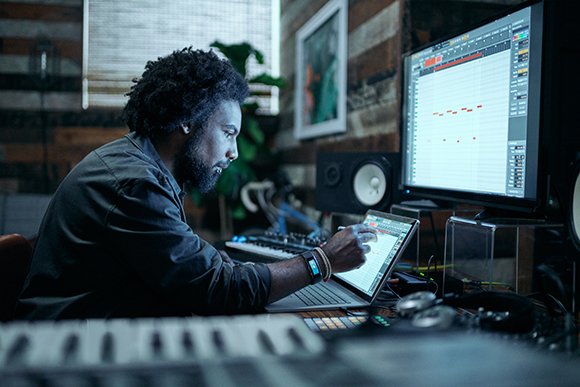 Whether you want to edit music at a professional level or just for the sake of fun – you can use WavePad to achieve quality editing results. It is developed by NCH and from their track record it can be predicted that this software will also be user-friendly and up to mark. WavePad gives you the opportunity to blend different tracks into one file and this way you can merge a playback sound or a music pattern while recording something. To be honest that is what exactly going on in the modern music industry. The basic functions of this music editor software come for free however you have to pay the $39.95 for buying the premium version which is not too much for those who want to use WavePad for high-level music editing. 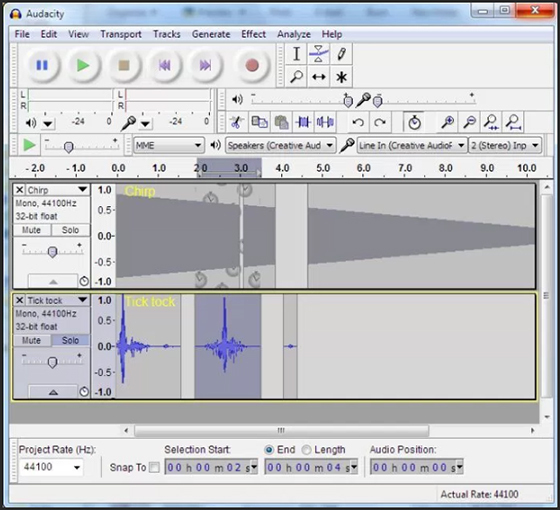 The fact that makes Audacity desirable is its simple user interface. It is completely free music editor software with all the features and quality that can be found in other expensive ones for example live recording and multi-track editing. it has functions of reducing voice or noise and provides easiest editing by simple cut and paste method. In addition to all of this, it offers multi-platform support and gives propitious sound effects which settles the argument that it is one of the best free audio editor software. Free version of Audacity can be run on Windows, Mac as well as Linux and can be downloaded from its official site. 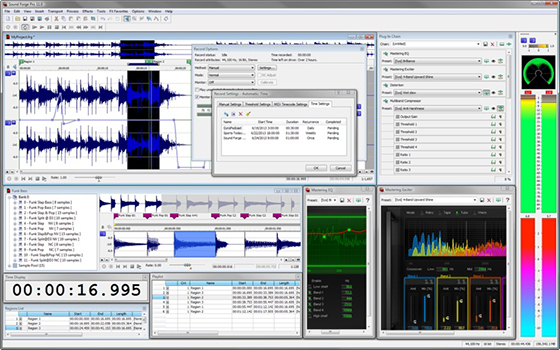 Wavosaur can tackle your basic audio editing requirements for music. You can use it for fusing multiple audio files together and also blends the support for Visual Studio Technology to step up your editing expectations. 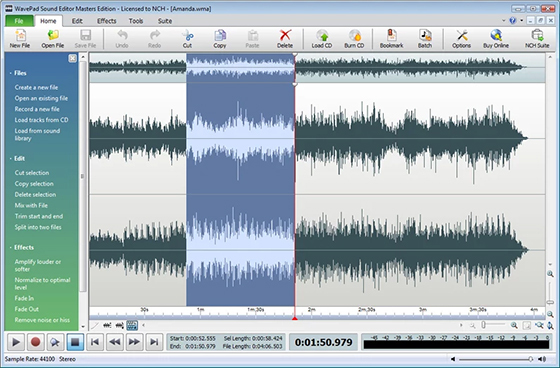 Wavosaur is free music editor software and it can be downloaded without paying anything. 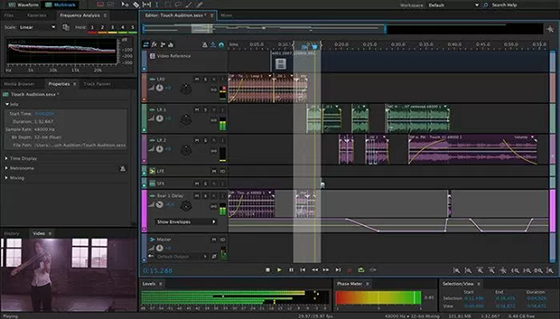 As many of us are already familiar with Adobe and their software products – it is easy to edit music with Adobe Audition. You can also use the detailed help section to understand the editing possibilities that can be done with this music editor software. Although you can download it and use it for free for first thirty days, you have to pay around $21 a month to continue using it further. LMMS is advertised a s a free cross-platform music editing software and you can use it on any operating system for music editing purposes. 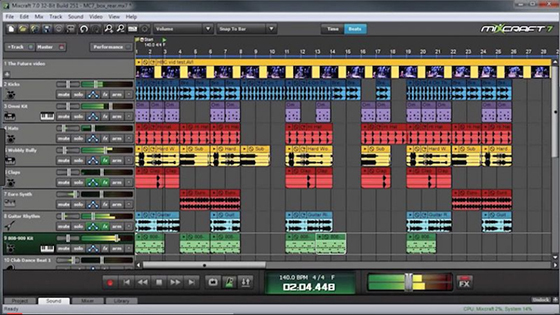 PreSonus Studio One is a high level editing software that comes in three versions. 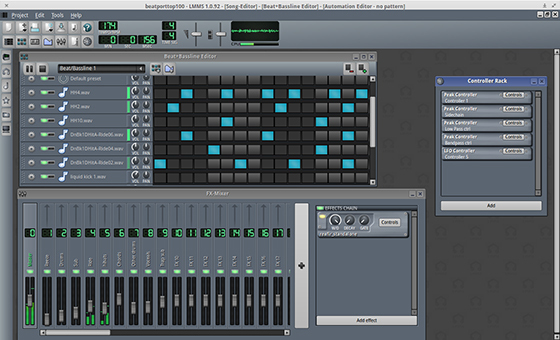 Free version has limited features but still worth mentioning among free music editor software. 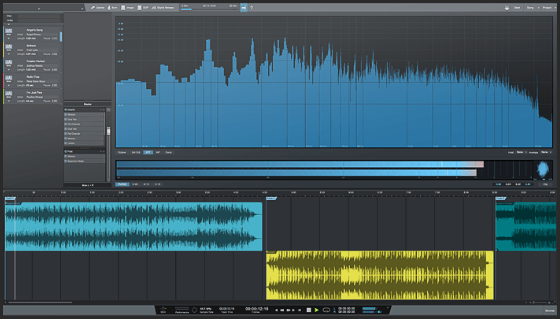 You can download the trial version of this music editor software for free however if you are serious about your music editing needs you might not hesitate to purchase Sound Forge Pro. It has multiple options and modes to suit the demands of any user. Acoustica Mixcraft is a state of the art tool for editing music however it comes with a price too. You can get the trial version for free to cater your basic editing needs and decide whether you want the complete version of Acoustica Mixcraft Audio editor or not. 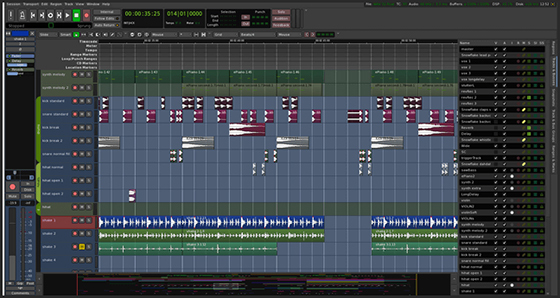 Ardour is a good catch as it has a lot of features for music editors and yet it doesn’t ask for a big price. You can add multiple plugins to it and enhance its capability. Ardour can be downloaded easily and you can use all of its features you have to donate at least $1. The perfect music editor software must have all the essential functionalities and an extremely easy user interface so that anyone can use it for their good without difficulty. If we take a look on the above-mentioned software we can clearly select Music Editor Free as the best option for your day to day music editing requirements.